Previously, on Argon Voyages, we took Argon to Stanley's boat yard in Barrington, RI for some major work on her mast and other systems. 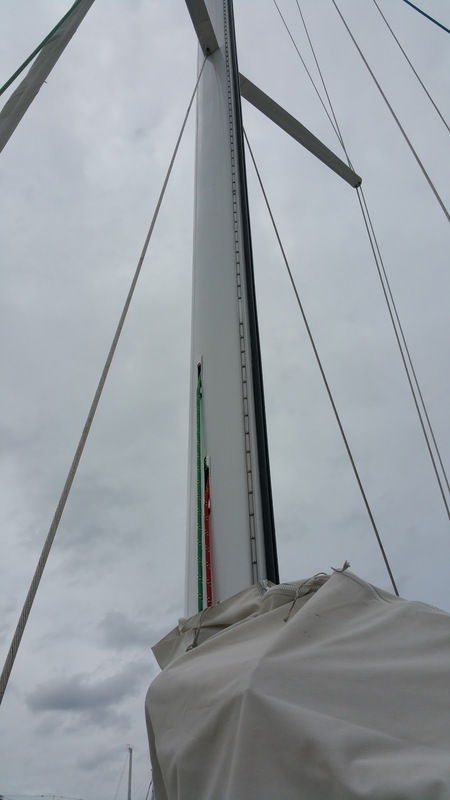 Along the way, we found some unexpected damage to the hoisting hardware on the mast. Damage to both headsail sheaves due to luff length of sails being too long. 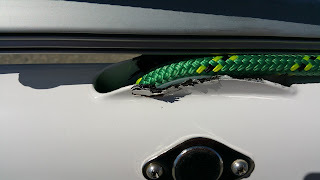 The sails (OEM from Tartan mfg by Sobstad) were definitely cut with too long of a luff length. 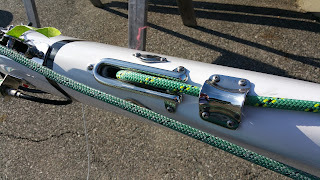 There was evidence of the shackles being jammed right into the sheaves. We had already had to shorten Argon's Main's Foot length by 2" the first season. 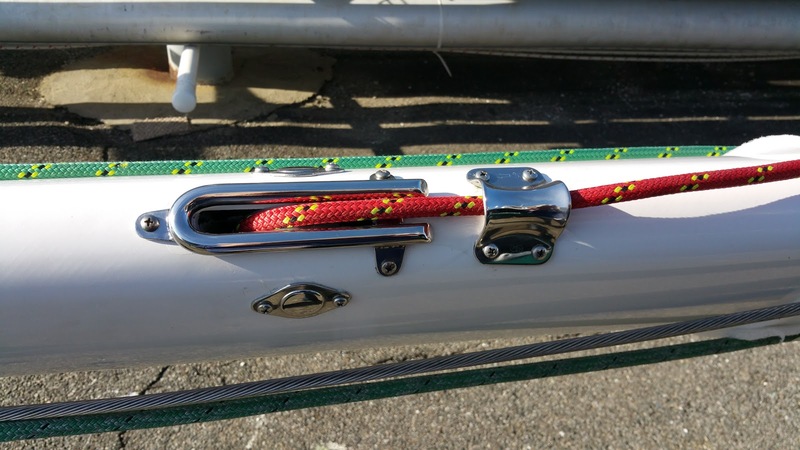 And we had just finished having 4" taken off of the Jib luff length over winter 2015-2016. Tartan has since started adding Halyard Restrainers to the mast at a point 4" below the sheaves. 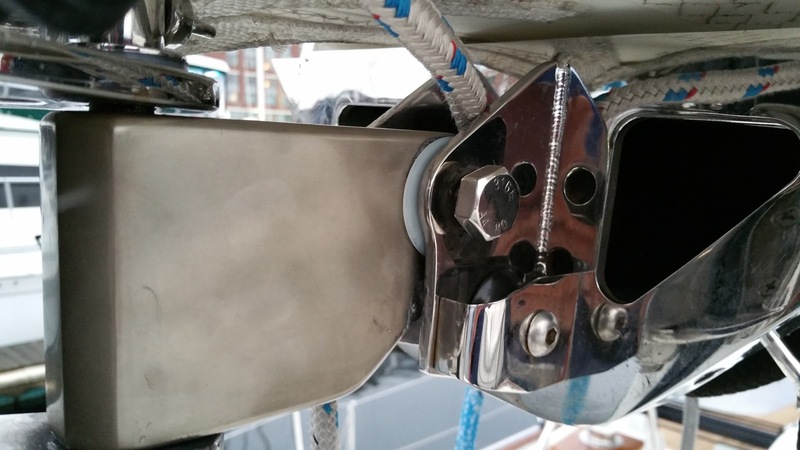 This keeps the halyard nicely stable on the sheave pulley and centered while furling. Tim Jacket said this was in response to complaints that the headsails on the 4000 were hard to furl in (we would concur with that). Hall agreed with the idea of adding the restrainers. This of course meant shortening both headsails even more. By the way, sail lofts don't shorten headsails for free. The Hall Spars team ground off the already partially ground-off raised carbon edges around the sheaves and installed some pretty stainless chafe guards. 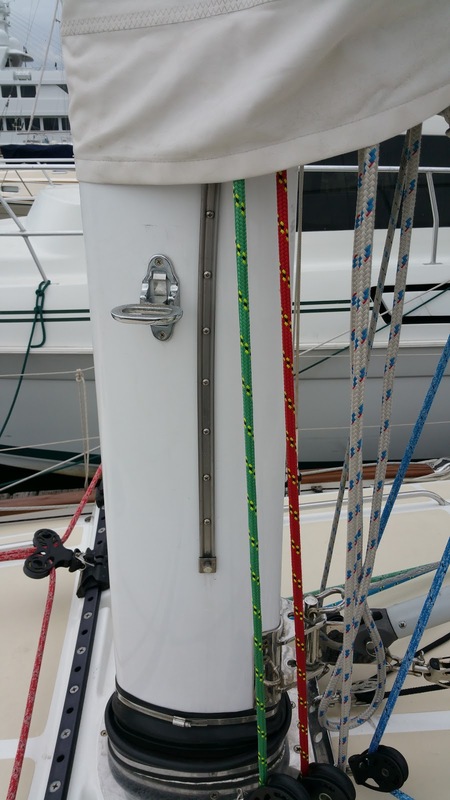 They also installed the Tartan-supplied halyard restrainers and a nice touch-up paint job. After returning to Boston, I took some photos with the telephoto lens of the sheaves with the sails hoisted and furled. Ike Bowen from Hall Spars personally came to Argon and measured the exact hoist length for the jib and reacher. This info was given to the North Sails (Portsmouth, RI) loft. We ended up having an additional 180mm and 340mm removed from the Jib and Reacher respectively. Here is the main reason we had the stick pulled. 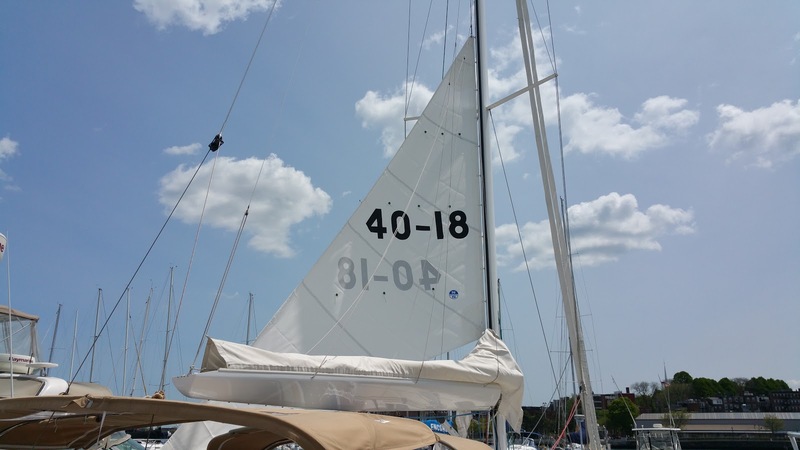 Hall Spars added a track for a storm sail. The Track is fully back-plated and installed very nicely. How did they get a back plate 20 feet up into the mast? Trained rodents is my theory. Let's hope we never need the storm sail track. 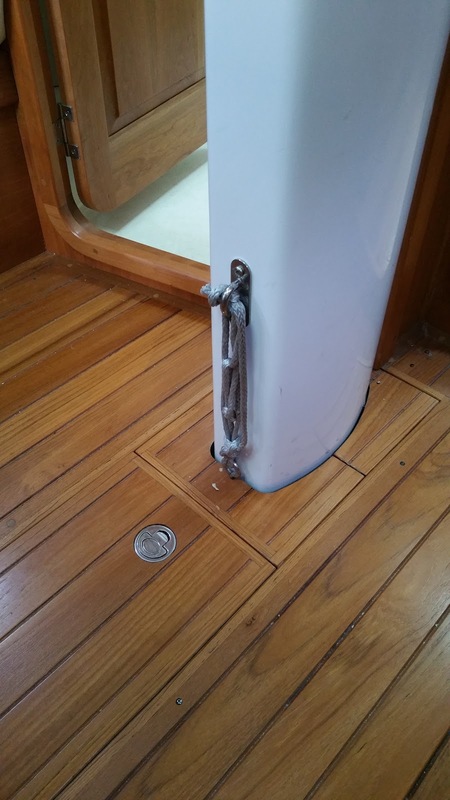 This is a Bermuda Race requirement for keel-stepped boats. We're not doing the race, but we think it's a good idea anyway. 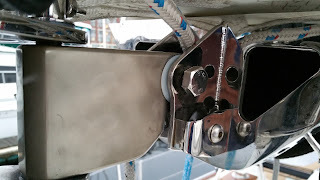 Hall Spars installed this strong padeye in the Mast. The stepping plate already had a nice 5/16-18 drilled and tapped hole at the base to add a stainless eye-bolt. Some Dynema and a truckers hitch to tie it down, and that's done. Let's hope we never need it. 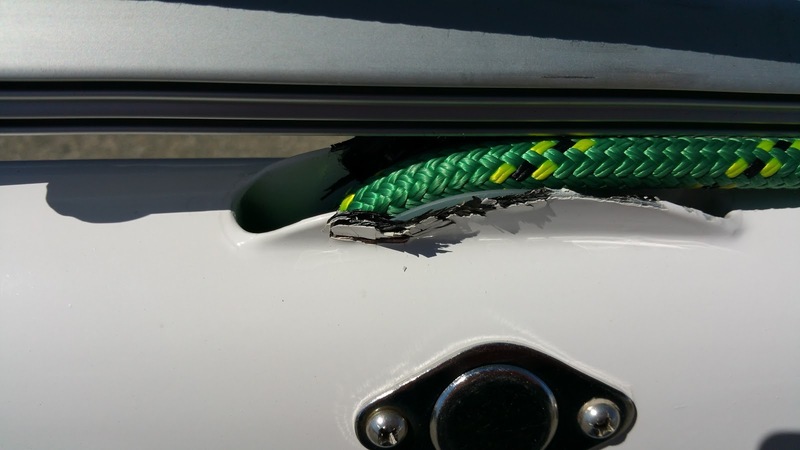 When Ike from Hall Spars came to the boat to measure the hoist, he also noticed that we had a lot of play in our boom gooseneck. He felt that there should be some nylon washers in there. Fortunately, Ace Hardware actually has a very nice selection of these and we have a good assortment in our spares kit now. 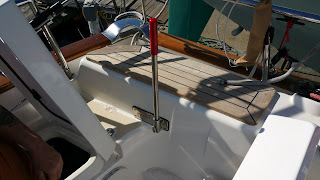 I manged to get these in on each side of the gooseneck bolt and it's much tighter (and quieter) now. 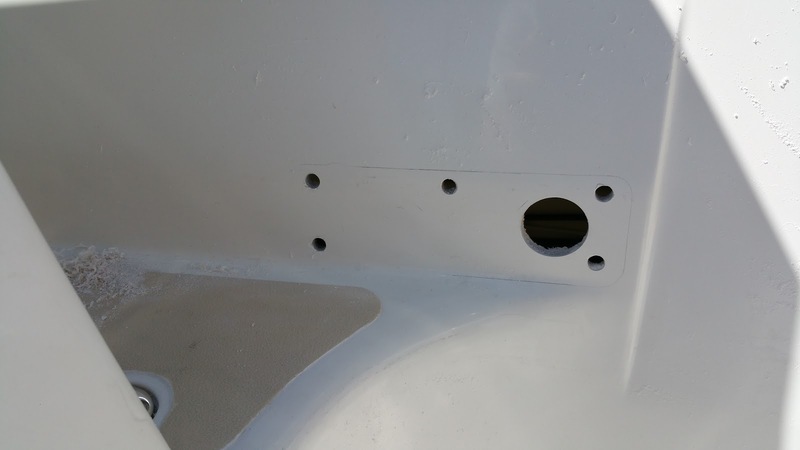 Plastic washers added to the gooseneck. Stanley's Boat Yard took on the task of mounting and plumbing the new Edson Bilge pump. The installation went smooth except for the fact that the first pump we tried actually had a pinhole in the bronze casting. Fortunately, Edson had another pump body in stock and with only costing an extra hour of yard labor, we were in business. There is still one more part to this project that is in-progress. The pump is heavy and I'm not comfortable having it mounted only on the surface of the coaming like this. So some G-10 and threaded rod will be epoxied to the underside of the coaming and the back side of pump will be suspended by the rods. 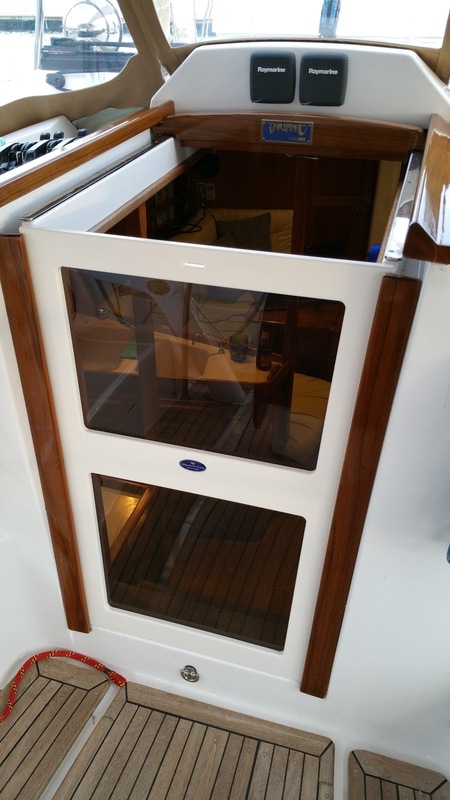 Argon comes with lovely 3-piece teak hatchboard for the companionway. They look pretty but they are a pain to deal with and take up a lot of storage space in the sail locker when not in use. I wanted to have a 2-piece acrylic hatchboard instead. I did a CAD drawing of what I wanted and we got that to Stanley's way back in January. 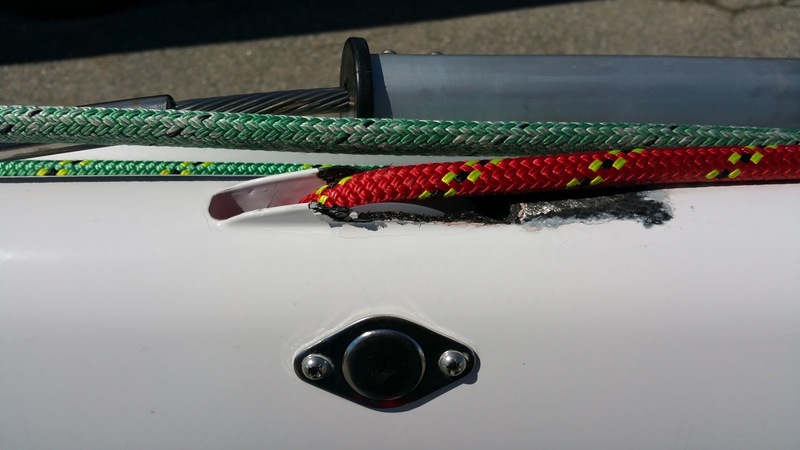 They in turn gave it to the subcontractor that they were going to use - Custom Plastic Solutions in Bristol, RI. This project sort of went into a black hole and we never had any contact with the vendor while in Barrington. With all the other stuff going on with the rig, this seemed to be low priority and we didn't know what to expect. However on the last day before leaving Barrington, these beautiful hatchboards arrived wrapped in bubblewrap. They came out better than we ever imagined. 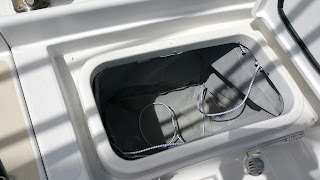 Another project we've had in mind is getting a custom pouch made for our transom locker. Phil Kinder at Kinder Industries suggested going with a strong mesh rather than canvas like most boats have. 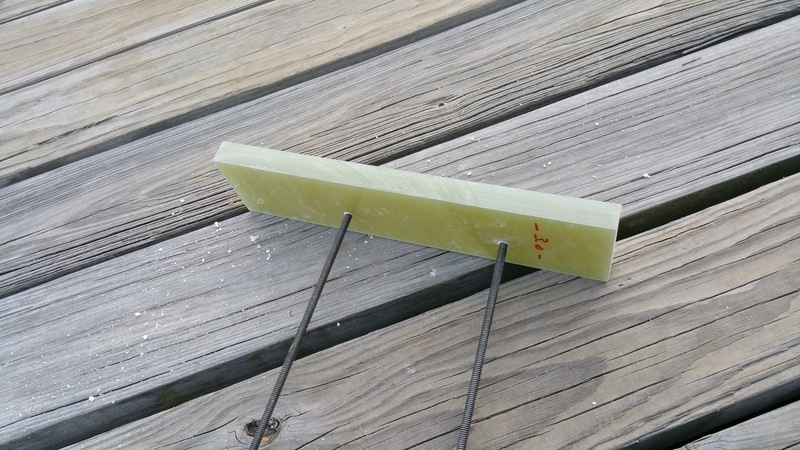 This will let any moisture drain and keep it from becoming a mold farm. 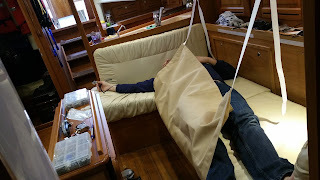 Besides this pouch, Phil also made us some Lee Cloths for the settees. 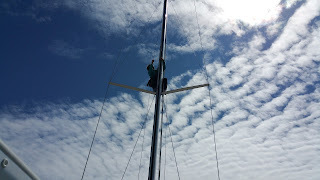 Even though the mast was just restepped, we ended up having to send a volunteer (Linda) up the mast part way because the lazyjack lines came undone and fell out of their blocks. These projects finished up the major remaining items as we prepare to venture off later this year. 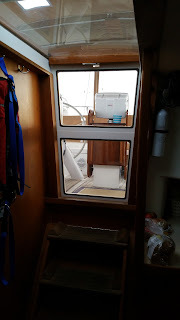 Of course we still have a myriad of small projects and regular boat maintenance but it is good to have all of these items checked off (and paid for)! Lots of significant steps completed towards your goal of being "gone". How long until you can throw away those spreadsheets of to dos? Just attached storage pockets on the inside of one of our lee cloths - places to put phone, glasses, headlamp and a book or magazine. I'll be making one for the other lee cloth before we leave this week. Jealous?